this smoked haddock and leek tart was one of the most popular dishes at our recent housewarming party and several people have requested the recipe - so here it is! i only had a tiny taste of this tart but really loved the gentle flavours of the sweet slow-cooked leek, smoky fish and richness of the creamy egg custard that held everything together - it's a nice alternative to chowder if you don't fancy soup but do want something similar in taste. i used double cream but you could lighten things up by using crème fraiche in its place. for the pastry, rub the butter into the flour until it resembles breadcrumbs. mix the egg yolk with two tablespoons of cold water and pour over the mixture. combine and bring together to form a ball - you may need to add a little extra water if the mix is too dry (i used c4 tablespoons of water). roll the pastry out to line a 25cm circular tart tin (c2.5cm deep) with removable base, pushing it well up the sides. prick all over with a fork and put in the fridge for at least 30 minutes. heat the oven to 200c and bake the pastry case* for 20 minutes until it is dry to the touch and almost crisp. turn the oven down to 180c. meanwhile, cook the leeks in the butter over a gentle heat until they are soft and translucent - try not to let the colour. remove from the heat and stir in the poached fish and parsley. place the mixture into the partly-cooked pastry case then mix together the cream, milk, egg, egg yolks and seasoning. 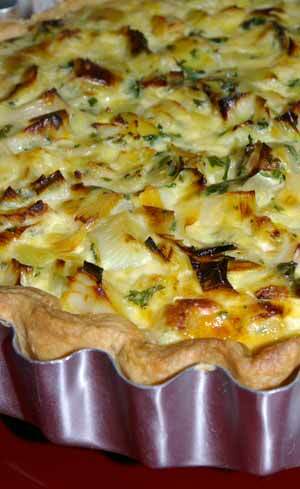 pour this over the fish and leek mixture until it reaches the top of your pastry case. bake for 35-40 minutes until the egg custard is just set and still slightly wobbly.